The 3 bears got a new pool in 2013 thanks to a donation from Joan and Mike Smith of California Pools and Landscape! Their pool was a birthday present to Joan (a big animal lover) from Mike. 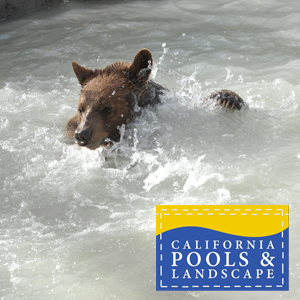 This is the second pool that California Pools has donated to our black bears. 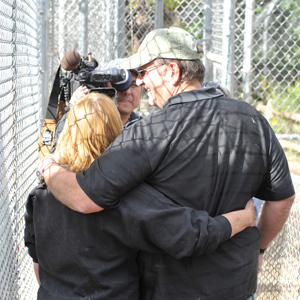 The first one was a wedding anniversary gift Mike surprised Joan with nearly 10 years earlier. Click on any of these images to visit California Pools and Landscape's website to see the beautiful work they do. You can tell them the bears sent you! Construction began at sunrise and ended just before sundown! Wild thanks to the many people and companies that donated equipment, time and skills. The bears couldn’t believe the wonder of their new pool! What a joy it was to watch! 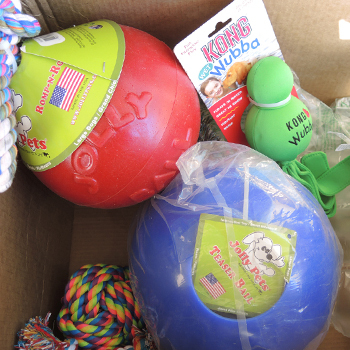 The General Wish List on Amazon shows items we use at the Sanctuary every day, like bleach and laundry detergent, but it also shows great enrichment items for the animals, if you prefer fun to practical! VISIT OUR AMAZON WISH LIST! Not sure how to give through Amazon? Amazon makes it easy for you to give to Southwest Wildlife when you shop. If you log on to Amazon through www.smile.amazon.com, and choose Southwest Wildlife as the charitable organization you wish to support, Amazon will donate 0.5% of the price of your eligible AmazonSmile purchases to us. Or just bookmark this http://smile.amazon.com/ch/86-0765249 and shop away. How easy is that? You shop, they give! Please contact us at swcc@southwestwildlife.org, or call 480-471-9109 for further details. Thank you! WE DO NOT ACCEPT CONTROLLED SUBSTANCES. Steve, Deb and Cody Svinicki of Building On The Level LLC, delivered a wonderful surprise. 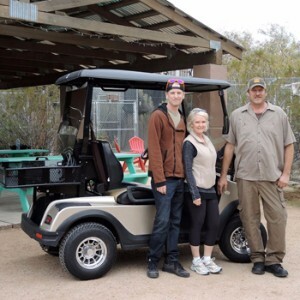 Deb had been on a tour of Southwest Wildlife and noticed how much we rely on golf carts to help us with daily chores. When friends, Mike and Vicki Wilds, decided to buy a new golf cart, they decided to donate their "old" cart to us. The Svinickis added some terrific metal utility baskets, and delivered the finished product. Thank you to both families for their generosity!